A week ago on Naval Base Kitsap – Bremerton, the Pacific Northwest became the hub of military innovation. An amazing turnout for the inaugural Athena Project event in the Northwest! 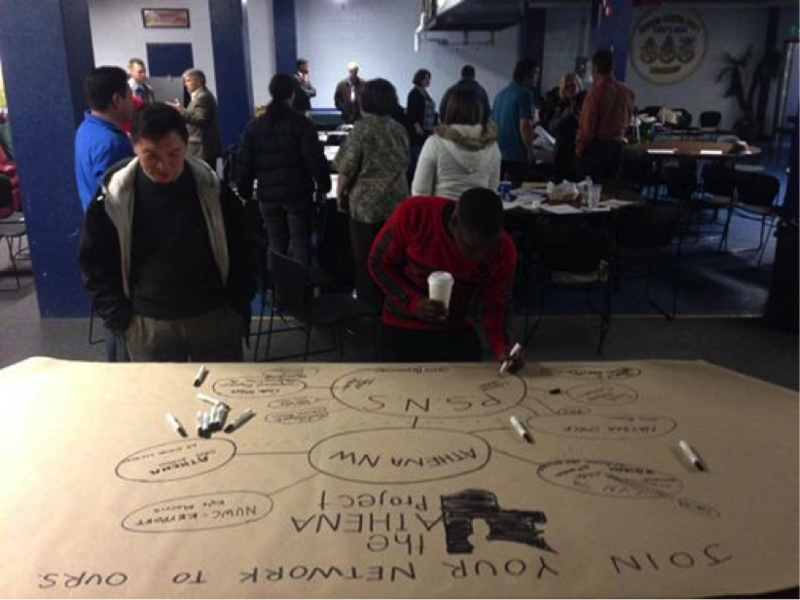 More than 50 people joined together in the old Chief’s Club beneath the Sam Adams Brewhouse to hear and support eight presenters who pitched ideas to improve their command, the waterfront and the Navy. Even though most left their jackets on because the WWII-era boiler in the building’s basement kicked the can earlier that morning, there were some hot ideas warming up that room, and for the first time at an Athena event, the stage was shared between four active duty and four DoD civilians. All of the presentations were truly inspiring and fueled a pervasive, let’s-make-it-happen, collaborative spirit. Chief Linkenhoker kicked off the event with some jaw-dropping numbers on how to save the Navy some cold, hard cash on deck and tile glue. Using a better applicator tool and a Military Specification (MILSPEC) equivalent glue, this idea could cut the Navy’s cost by nearly 80 percent! He did his homework to demonstrate that the alternative was identical in application, drying time, bonding characteristics, hazmat handling and more. He stole the crowd and never looked back, running away with the Admiral Sims’ award for Intellectual Courage. Next step, engaging the DoD supply system to add the alternative while submitting a Military Cash Awards Program package on Chief’s behalf. Nice work! AOC Linkenhoker breaking down tile glue costs for carrier maintenance. The first Puget Sound Naval Shipyard and Intermediate Maintenance Facility (PSNS & IMF) presenter was Steve McKee who showed there could be a relatively small gap to close between the use of commercial cellular technology and the Navy’s Geographic Information System. Who knew the Navy has a GIS?! In the same way Google Maps can tell you where the nearest pizza joint is, or FedEx can tell a truck’s location and inventory through the use of cellular technology and a GIS, the Navy could truly benefit from tying its GIS to a cellular interface for shore-based installations. Imagine being able to find a tool, component or base service simply by referencing your phone! The major obstacle identified involves conquering the cyber security element; however, McKee convincingly pointed those in attendance to a number of cost and time saving applications that show the benefits may truly outweigh the costs! LT Kardos presented a very succinct requirements list for a modular, adaptable, electronic administrative software suite. Modular components would work like a suite of administrative apps that would synchronize and interact with one another, and operate in a stand-alone environment with periodic updates when the Internet was available. Individual modules or apps would handle everything from award generation, document management, and correspondence tracking to document control and evaluation submissions. His problem statement seem to resonate well with the audience—“The Navy has a system of forms control that is out of control!” His idea mapped a way forward to bring all administrative functions to a flexible, adaptable, single source structure. Unlike many of the suggestions posted in the Navy’s Reduction of Administrative Distractions efforts, he provided an actionable requirements set for software that can solve a myriad of administrative headaches. All the way from Keyport, Washington, Kyle introduced the audience to a long list of 3D printing applications for both ship-board and industrial use by providing the audience with photos of more than 30 cost-saving examples of 3D printing. The Sailors in the audience were interested in how to maintain the 3D printers if they were installed on a ship. Their questions beckon a follow up with the folks in San Diego and Hawaii on their attempts to integrate 3D printing onto ships and submarines to find out more! 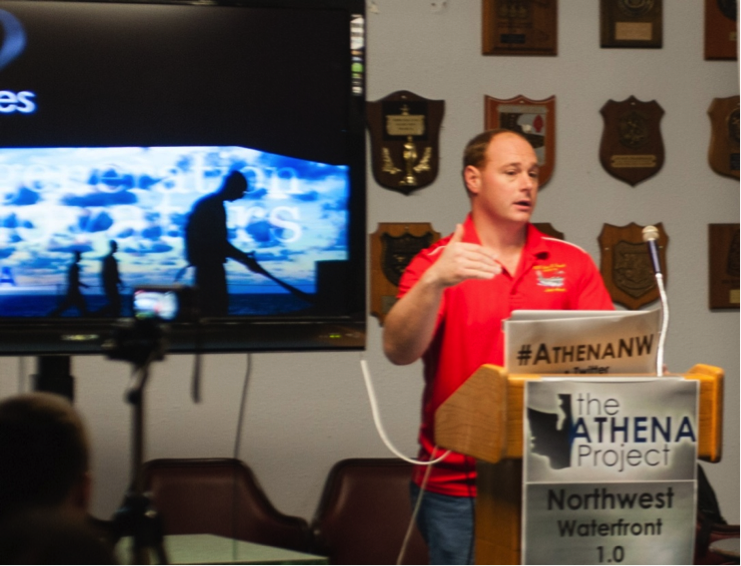 Placing third at Athena Northwest, Jensen engaged the imaginations of the audience by describing how an instrument with two video cameras and some software can help map a space three dimensionally, allowing maintenance professionals on shore to conduct remote diagnosis, redesign, and the ability to purchase or fabricate solutions without having the ship tied to the pier. The installation or corrective actions would be programmed into glasses that provide an augmented reality overlay to simplify executing the repairs or modernization efforts. To leverage the strategic advantage of this technology, Jensen encouraged considering applications now and organizing thoughts on the benefits of this emergent technology. His ideas align well to the Augmented Reality workshop hosted by the Chief of Naval Operations’ Rapid Innovation Cell in Norfolk on Dec. 8 (Editor’s Note: Anyone else with ideas should consider attending the event; find out more here!). Arguably the most motivational idea, ABF3 Johnson’s pitch was proposing not an innovation of technology but one of perspective. He passionately described a handful of ways to integrate collaboration and relationship building into new and existing programs. By making command picnics, MWR events, intramural sports, community and base service events, career fairs and departmental expos open and inclusive of all entities of the DoD/active duty team, we will achieve greater performance, efficiencies and innovation development. At the conclusion of his presentation, several inspired audience members shared with him how they will move his idea forward in their own spheres of influence. Certainly aligning with the values of the Athena project, he touched on the synergy created when a wide variety of perspectives combine to advance a common purpose. Looking forward to seeing these ideas in action for the next major maintenance availabilities! Finishing in second place, Stamper described a precarious scene familiar to many shipboard maintainers—standing unsteadily above a shaft while balancing a tool bag perilously on a ledge with one hand and taking readings or measurements with the other. The maintainer often has to sift through an unorganized tool bag that is difficult to strap down or hang up. Stamper then rolled out a highly-refined prototype of the perfect solution—a backpack that unzips to fold out flat, with hooks on the outside to easily hang it from any nearby pipe or angle iron, which reveals a perfectly organized tool board with tools strapped to slotted plastic panels. He is currently securing a Navy patent for the product, which will undoubtedly make life easier for an untold number of maintainers across the Navy (perhaps even the DoD)! Who wouldn’t love to see this idea on the fast track to the Navy supply system?! Using several stories about how physiological measurements of a person’s state of stress can predict both operational and relational performance, LCDR Barker proposed an experiment to utilize wearable devices similar to a Fitbit to measure a team’s individual and collective stress levels through skin temperature, galvanic skin response and heart rate. The device would take measurements to show team and individual responses to both internal team dynamics and external challenges faced by the team. Observations, he argued, would lead to increased understanding of team dynamics, leadership and educational influences, and may assist in how we develop our people to achieve higher performance. The audience helped expand his idea to potentially benefit those with PTSD or better understand the struggle the military has with those who contemplate suicide. Watching the development and expansion of the idea in real-time was truly exciting for all engaged in the discussion! The event reflected the hunger for innovation that many share in the DoD and attested to an abundant well of inspiring ideas that spring up from the deckplates. Everyone seemed to leave the venue with a sense of excitement and engagement to help make positive changes possible. Stay tuned for the next event to come in late February, which promises to be even better with the integration of several other commands from Bremerton, Everett, Bangor and Keyport, as well as the involvement of more of the area’s community and academic leaders. 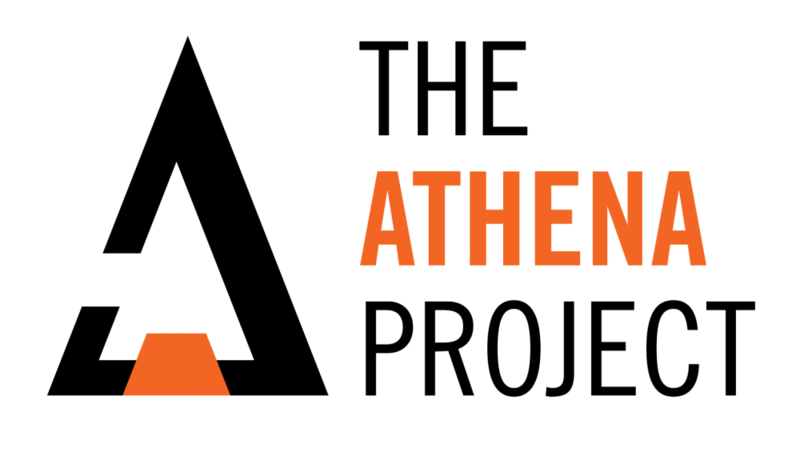 For the most current information on Athena Northwest, visit the Athena NW facebook page: https://www.facebook.com/athenaprojectNW.